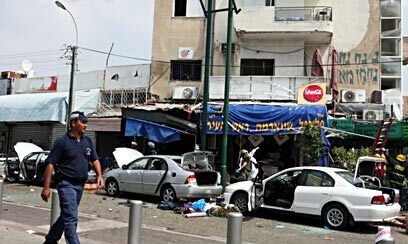 (VIDEO) Terror disrupts Passover celebrations once again: Nine people were killed Monday after a Palestinian suicide bomber detonated himself at a crowded fast food stand near Tel Aviv's old central bus station, in the city's southern Neve Sha'anan neighborhood. At least 68 people were wounded in the huge blast, which was heard kilometers away, including one person who is in criticial condition and nine others who sustained serious wounds. Two of the victims were pronounced dead upon arrival at the hospital, while a third victim died on the operating table. The name of one bombing victim, Philip Balahsan from Ashdod, was cleared for publication Monday evening. Balahsan was at the site of the bombing with his two children. His family has been notified. 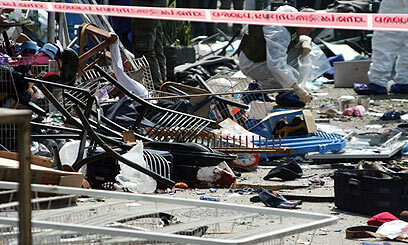 The explosion occurred around 1:30 p.m. at a shawarma stand, where a previous bombing took place. This time, however, the blast was much more powerful and deadly. According to a videotape released by the Islamic Jihad in Jenin, the attack was carried out by Sami Salim Khamad, who entered Israel from the West Bank. Fatah's al-Aqsa Martyrs' Brigades also claimed responsibility for the attack. According to one eyewitness account, the terrorist entered the store and detonated himself when a security guard at the site asked him to open his bag for inspection. A short while after the explosion, police forces engaged in a chase after a blue Mitsubishi vehicle seen fleeing the area of the attack carrying three people. The vehicle was stopped a short while later and the three suspects were taken into interrogation. Later, the suspects were released after it was established they were not connected to the bombing. 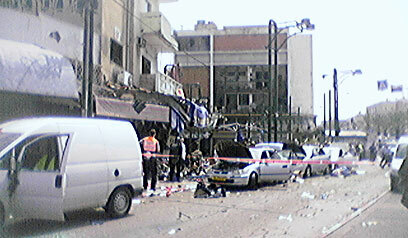 Yael Garti, who witnessed the explosion, told Ynet: "I saw people running in every direction. The shock was felt in neighboring buildings. Ambulances arrived within minutes. Many people gathered in the area." The owner of a nearby store said that he is already used to the sounds of terror attacks, but that this time the explosion was extremely powerful. "When we left the store, we noticed a lot of injured people on the floor. We rushed back to the store and shut it down," he said. Brigadier-General Danny Chen, deputy commander of the Tel Aviv District, told reporters: "This is a strategic, sensitive and problematic place in Tel Aviv." The previous terror attack in the area took place in January, when an Islamic Jihad suicide bomber detonated himself next to the same shawarma stand, wounding 32 people. Following the attack, the stand owners positioned a security guard in the area. Throughout the Passover holiday, security forces were dealing with concrete terror warnings. Large forces were deployed across the country, in central junctions and in entertainment venues. However, there was no concrete warning regarding plans for an attack in southern Tel Aviv. Immediately after the attack, security forces raised their alert level across the country. See all talkbacks "9 killed in Tel Aviv blast"